Calcium hardness is the third important test to keep your water balanced, with pH and total alkalinity being the other two. When testing pool water for calcium hardness, what you are really measuring is how soft or hard water your swimming pool water is at any given moment. 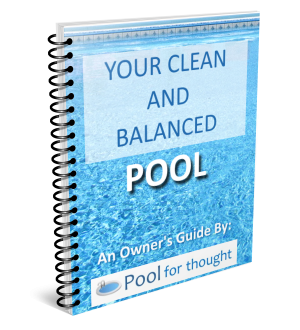 Pool water where the hardness level is too high or low contributes to a pool that has unbalanced water. This article explains the why calcium hardness needs to be tested, the various ways to test your swimming pool calcium hardness level, and a few tips to help you along the way. I also wrote an article on maintaining pool calcium hardness, where I explain the importance of pool water hardness, and what can happen to your pool if the calcium hardness level is too low or too high. After you test calcium hardness in your water, read more about how to lower your calcium hardness or how to raise your pool water calcium hardness level. Why is Testing Pool Calcium Hardness important? 1 Why is Testing Pool Calcium Hardness important? So much attention is given to total alkalinity, pH, and sanitizers like chlorine and bromine, that calcium hardness is seems less important than the other levels. To maintain balanced pool water and prevent any potential damage from happening, testing calcium hardness is just as important as the other levels in your pool. Pool water with calcium hardness too low might appear sparkling clear, when in reality the water is actively corroding surfaces of your pool. This is one reason to test your pool, even when the water is clear and appears balanced and healthy. Fortunately, calcium hardness in pool water usually does not change rapidly over short periods of time, so only occasional testing is really needed. A monthly hardness test is usually recommended, or any time you make major changes to the pool water like draining the pool and adding fresh water back in. Calcium, magnesium, and other trace elements are naturally present in your pool water, and you want these in your water. How concentrated these dissolved elements are present in your pool water determine if your water tends to be softer or harder. You do not want to completely strip your pool water of all elements, as too soft of water can be as damaging as too soft of water. We test calcium hardness, why not magnesium? With the correct testing tools, calcium hardness is easy to test and you can quickly determine if you have soft, hard, or balanced pool water. Calcium hardness testing is easy with test strips. Earlier test strips for testing hardness only could test total hardness, meaning calcium plus magnesium. You can now buy test strips that test only calcium hardness. Test strips are the easiest to use, but they are not as accurate as a test kit, and cannot test to the same resolution of hardness. Remove one test strip from it’s container and immediately close the container. Dip the test strip in the water, about elbow length into the water for about 15 seconds. Remove the test strip and set it on a flat surface, but not in the sunlight. Compare the resulting color of the test strip to the color sample provided with the test strip container. You will be able to estimate the amount you are over or under, in ppm. The test strip container might also have recommendations on how much calcium chloride to add if you are under the low limit for calcium hardness. If you are over the hardness limit, you will need to lower your pool calcium hardness by partially drain the pool and add fresh water, as your water has too many minerals dissolved in it. Quality test kits usually include a test for calcium hardness, plus other important water balance and sanitation tests. The most accurate way to test calcium hardness is with a water hardness test kit. You can find inexpensive water hardness test kits, or more useful pool test kits that provide a wide range of water tests, including a test for calcium hardness. The following are example test instructions for a Taylor brand test kit, so they cannot be applied to all test kits. Always follow the instructions on the test kit. Rinse out and fill the comparator tube. Fill the tube according to the test kit instructions, 20mL for Taylor. Add 20 drops of calcium buffer reagent (Taylor R-0010), then swirl the comparator tube to mix. Add 5 drops of calcium indicator solution (Taylor R-0011), then swirl to mix. The mixture should turn red. Add the hardness reagent (Taylor R-0012) drop by drop. Count each drop and swirl the mixture after each drop. Do this until the mixture changes from red to blue. Multiply the hardness reagent drops by 10. This value is your calcium hardness, in parts per million (ppm). If this value is below the ideal range (150-400 ppm), your test kit includes a chart showing how much calcium chloride to add to your water based on your pool size and amount you need to add in ppm, as you need to raise the calcium hardness level in the pool water. If the test result is high, then you need to partially drain the pool, as you need to lower the calcium hardness. When using a test kit, a common problem encountered is called fading endpoint. The color change in the comparator tube starts, but returns to the original red color or turns purple instead of the expected blue. Copper or iron present in the water usually causes this problem. To correct this, do the test again, but add six drops of hardness reagent to the new water sample before adding the first reagent. Always test total alkalinity and pH levels before testing the calcium hardness. The reason for this is you may first discover your alkalinity or pH may need to be adjusted, requiring the addition of chemicals to raise or lower the values. Adding substances such as soda ash or baking soda can raise pool water hardness levels over time. If you know your calcium hardness is high before your test, you can save yourself some time with a test kit by filling the comparator tube half full (10mL for Taylor), then use 10 drops of hardness reagent (R-0010), 3 drops of calcium indicator (R-0010), then add hardness reagent drops (R-0012) and multiply the drops counted by 25. Testing calcium hardness is one of the three main water balancing tests you need to do to monitor how well your pool water is balanced, and adjust the calcium hardness level if necessary. Keeping your pool water hardness in check can help reduce the chance the water becomes too corrosive or encourages the formation of water scale, and help make pool ownership easier and more enjoyable.